Transportation is the lifeline that connects persons with disabilities with the community, and facilitates greater opportunities for work, social inclusion and overall independence. Adequate accessible transportation has long been a concern of persons with disabilities, yet there is a dearth of sustained research on the legal and societal implications of transportation inequality for persons with disabilities. This article contributes to the research on both transportation inequality and equality theory by providing an empirical and theoretical analysis of the human rights tribunal decisions on transportation equality in Canada. In doing so, it examines the issues from the perspective of the voices of persons with disabilities by focusing on the substance of their legal claims. Ultimately, the author argues that narrow interpretations of prevailing law and doctrine have resulted in missed opportunities for achieving transportation equality on the ground for persons with disabilities. These opportunities may be captured by the application of a new theory of equality that addresses disability discrimination through the lens of what the author terms the ‘universality of the human condition’. 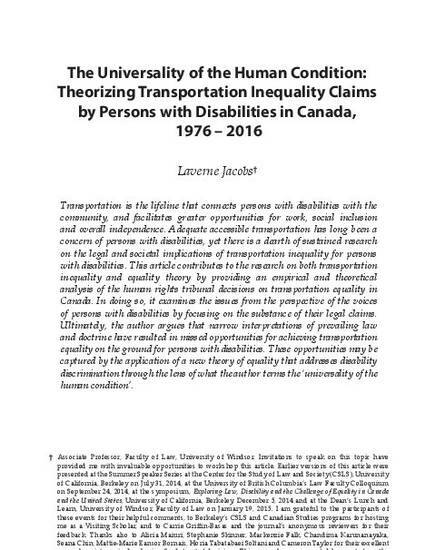 Jacobs, Laverne, The Universality of the Human Condition: Theorizing Transportation Inequality Claims by Persons with Disabilities in Canada, 1976 – 2016 (June 26, 2018). (2018) 7:1 Canadian Journal of Human Rights 35-66.